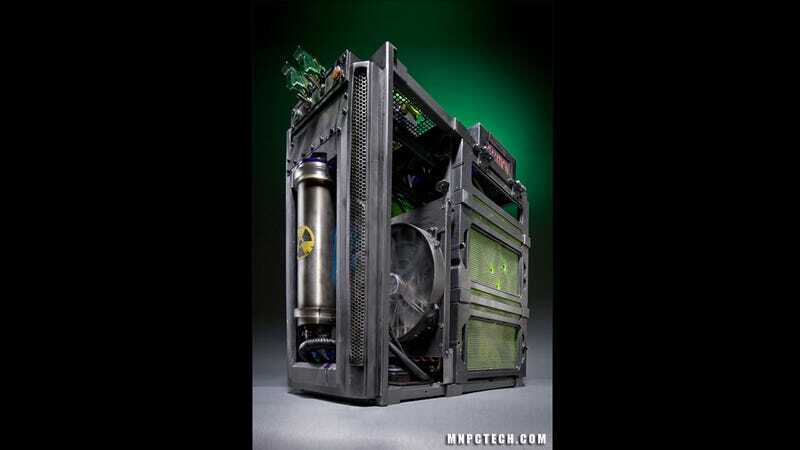 This gorgeous monstrosity was once an Antec Lanboy Air, which is lovely but hardly capable of surviving a nuclear holocaust. Mod Brothers Podcast host Kyle Van Der Mewre and Mnpctech's Bill Owen saw fit to fix that, and fix it they did. Bristling with switches and hoses, swathed in neon green, and fitted with a pair of Gullwing-style spring-loaded side panels, the imposing "Apocalypse" mod is a prime example of the sort of amazing art that comes into existence when two masters of the modding craft combine their talents. Check out the video for a candid peek at the creation of this beast, or hit up the link below to find a detailed log of the PC you could have created if you just applied yourself.